As we settled into our seats in the unusually packed Crowell Concert Hall before the Kronos Quartet’s performance on Sunday night, the woman sitting next to me confided that she had been listening to the string quartet for forty years, but this was her first time seeing them in person, an occasion which had prompted her to endure a two-hour drive through the pouring rain. 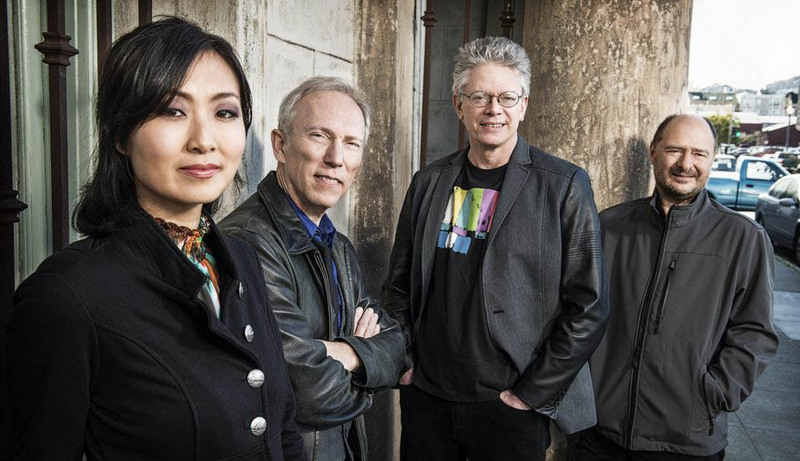 Since first violinist David Harrington had founded the group in the 1970s, she told me, the musicians’ hair had gotten considerably less voluminous and their audience less young and rowdy. But the San Francisco-based ensemble’s music certainly remained equally groundbreaking. Many of the program’s pieces were adaptations of music from various traditions for the string quartet, which often required the musicians to sonically transform their instruments into different ones altogether. In an arrangement of the Hindustani piece “Dadra in Raga Bhairavi,” by the Indian-American composer Reena Esmail, the upper strings evoked the tender, wobbling melodies of the gakayi ang vocal style, while the group’s cellist, Sunny Yang, played the part of the South Asian percussion, called the tabla, at some times rapping on the body of her cello and at others tapping her fingers on the strings to create a soft percussive effect. In Tanya Taqag’s “Sivunittinni,” the instrumentalists imitated the guttural tones of Inuit throat singing, contorting the angle of their bows to create a texture akin to the scraping call of cicadas, causing the audience members to experience visceral bodily discomfort. Several of the pieces also incorporated items that would not traditionally be considered instruments. In “Pencil Sketch,” composed by Yevgeniy Sharlat, the piece began with Harrington laying his violin onto his lap, the first indication that the “instrumentation” of the piece would be out of the ordinary. He then pulled out an unsharpened No. 2 pencil and began to use it to lightly pluck at his violin’s strings. The musicians didn’t just use pencils for pizzicato, though. They used them to bounce on their instruments or to scrape at them until we could hear the strings’ texture. Meanwhile, those musicians that still wielded bows played them below the bridge or above the fingerboard, far past the points of normal contact, to create scrapes and vibrations that were often scarcely perceptible. The piece brought to the forefront issues of what makes something, such as a pencil or a string quartet, obsolete and how such objects or genres can still create art that is formally innovative. It also examined the process of creating music, using the pencil—a tool of revision—to perform the failures of this mark-making process. Mario Galeano Toro’s piece for the Quartet, an upbeat, frantic dance beat entitled “Microsurco de Liebre,” was also somewhat of a temporal commentary, with the instrumentalists accompanied by and reacting to a rhythmic track that was constructed from the scratches on old ’78 records. Another of the more unusual pieces, composed for the Quartet by Nicole Lizée, incorporated colorful toys, such as flexible plastic tubes, which the musicians swirled in the air to create different frequencies, as well as tiny bells that they rang with their feet mid-piece. The overall effect was both nostalgic and intensely disorienting, with the sonic gap between the screeching toys and instrumental warmth putting the viewer in an emotional place somewhere between creepy suburbia and the overwhelming kitsch of an MTV video. Oddly enough, in the expert hands of Kronos, this vibe succeeds and also manages to be a profound examination of the scale on which sound can or needs to be produced, whether conjured by the warm tones of a cello or produced by a single, coordinated sigh by the two violinists. One of the most poignant choices in the program was the Quartet’s world premiere of Jacob Garchik’s arrangement of the John Coltrane piece “Alabama,” an elegy for the four young girls killed in the 1963 KKK bombing of the 16th Street Baptist Church in Birmingham. Garchik preserved Coltrane’s low, haunting melody in his sensitive arrangement, which started on the cello and was slowly passed to the first violin. Harrington noted that the piece that followed, Terry Riley’s “Good Medicine,” had been written as something of an anecdote to the hopelessness of Coltrane’s piece. The Quartet seemed to have fun with the folksy, fiddly tune, which later turned into something more urgent, its repetitive, frantic, nature very much evoking the mythological rite that it was intended as. The Quartet finished their concert with two encores. First, they accompanied the vocalist and Wesleyan graduate student Judith Berkson as she performed a startlingly low and spare rendition of Schubert’s “Die Krähe,” or “The Raven.” They then closed with a spirited rendition of the Avett Brothers’ version of “The House of the Rising Sun,” starting the piece with the familiar chords being subtly introduced on cello and then spiraling into an intensely cathartic conclusion so loud and energetic that it sounded like it could have been played on electric guitar rather than string instruments. After the concert, the woman sitting next to me asked if I would walk her through the rain to her car. I asked her if the concert had lived up to her decades of expectations. Still humming the Schubert, she replied that it had exceeded them. Dani Smotrich-Barr can be reached at dsmotrichbarr@wesleyan.edu.